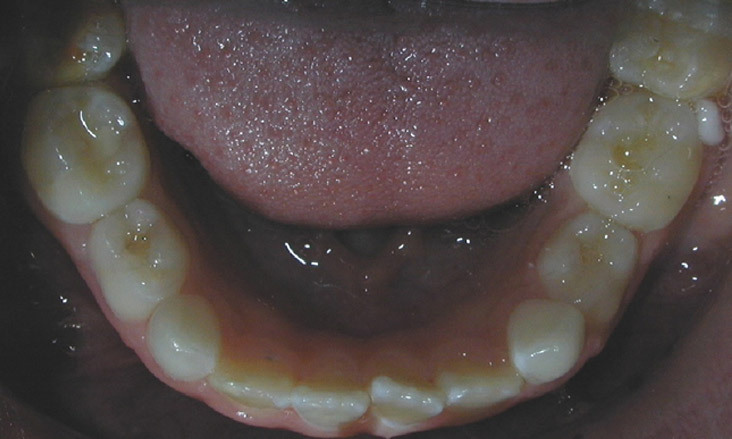 This patient has bilateral posterior crossbites and an anterior open bite associated with chronic mouth breathing. 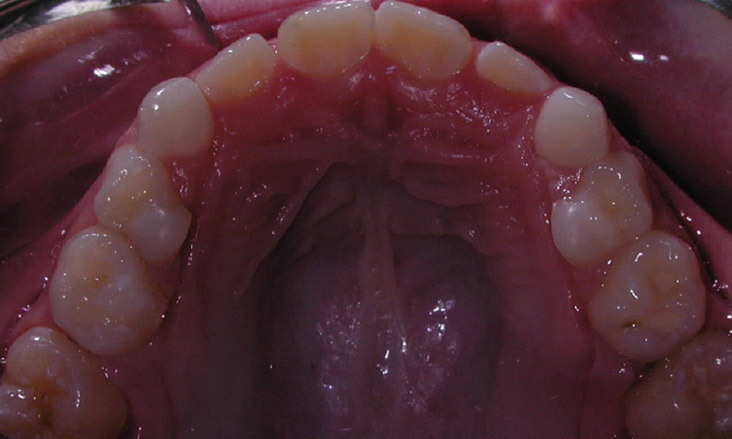 The adenoids and tonsils were removed as a treatment for obstructive sleep apnoea. 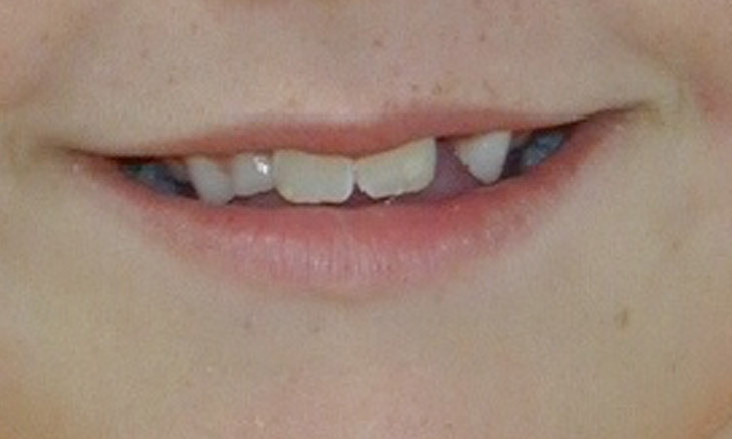 There are a number of baby (deciduous) teeth still present. 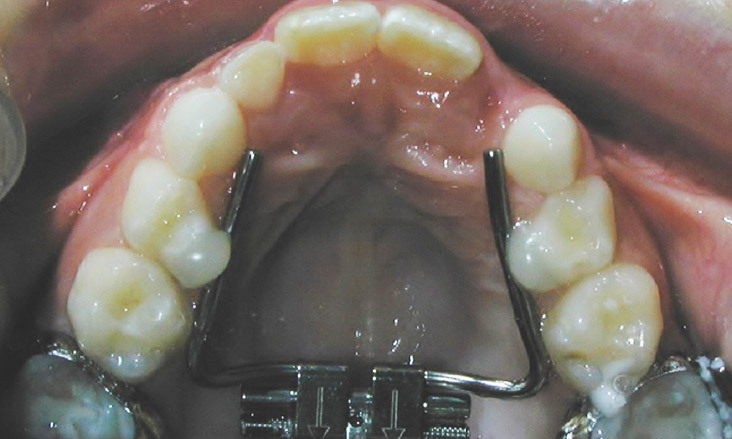 In these situations, a device to move the upper teeth and jaws laterally (rapid maxillary expander or RME) can be used to treatment the crossbite. 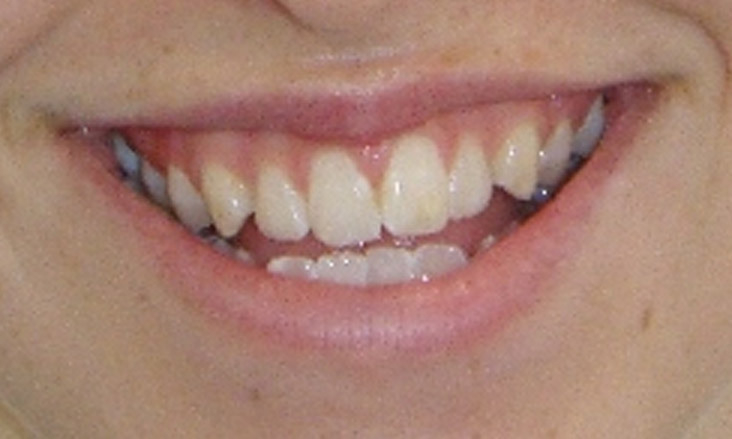 This also results in extra space for the eruption of the upper teeth. 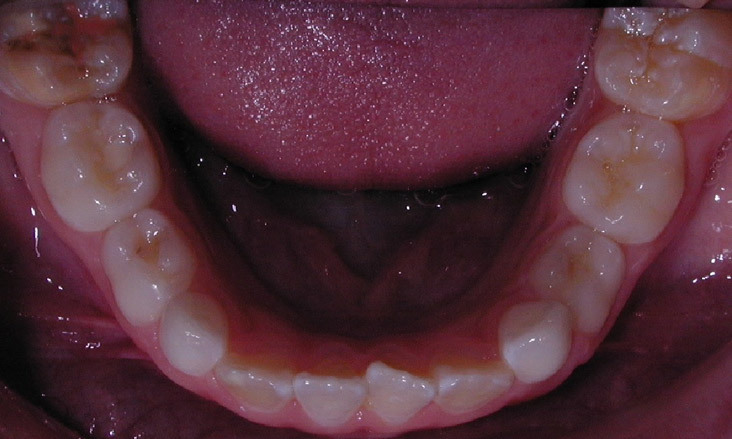 This shows the RME in place. 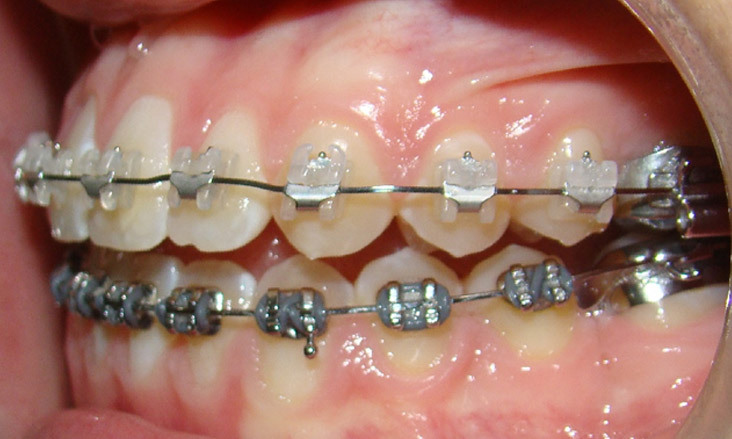 There are a number of different types of RME. 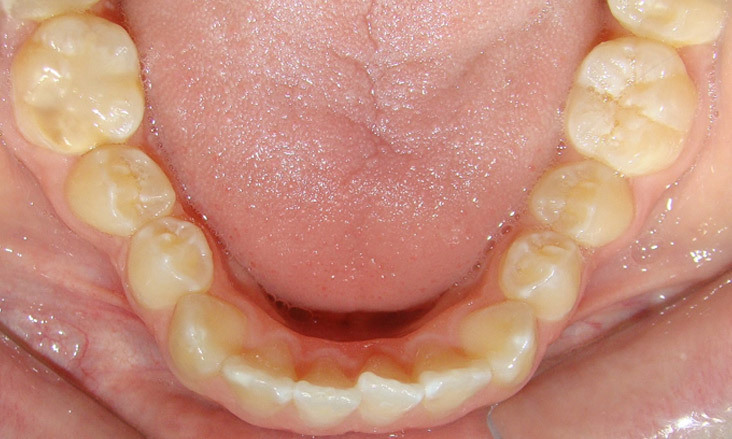 The RME has been activated resulting in the upper back teeth moving laterally. 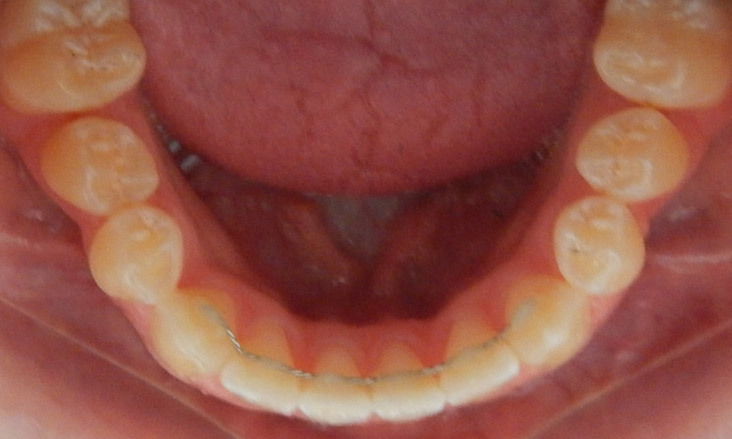 The RME has been removed. 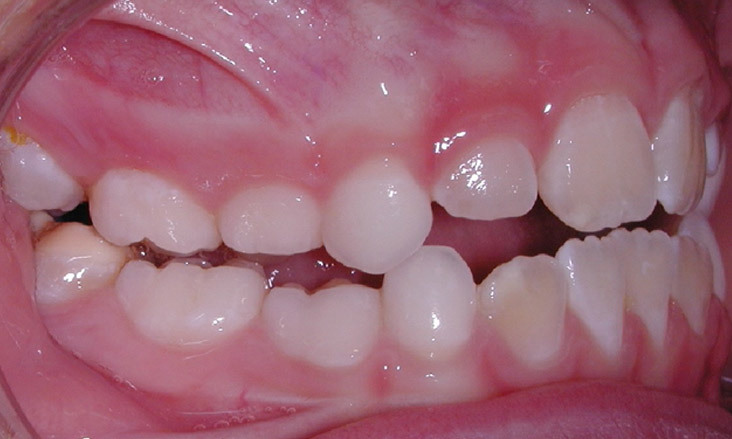 Note the indentations in the gum on the roof of the mouth from the arms of the RME and how the upper teeth at the back now sit outside the lower teeth. 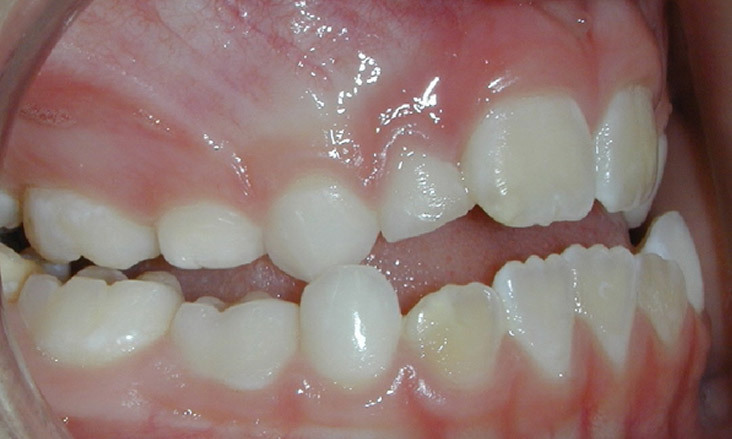 We overexpand the upper back teeth as they are likely to move back towards the midline over time. 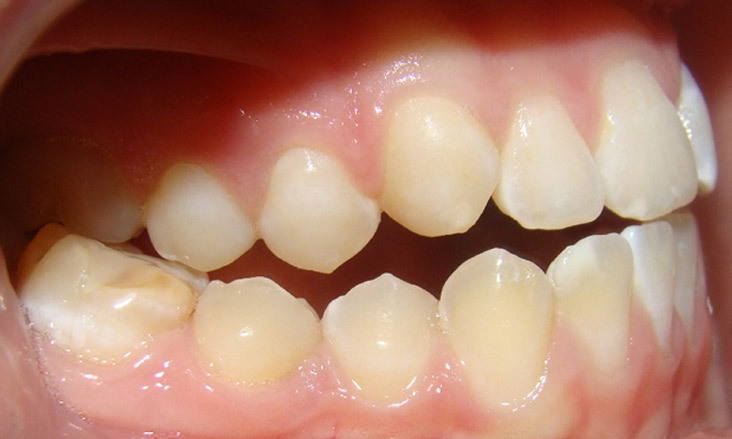 Four years later all the adult teeth have now erupted. 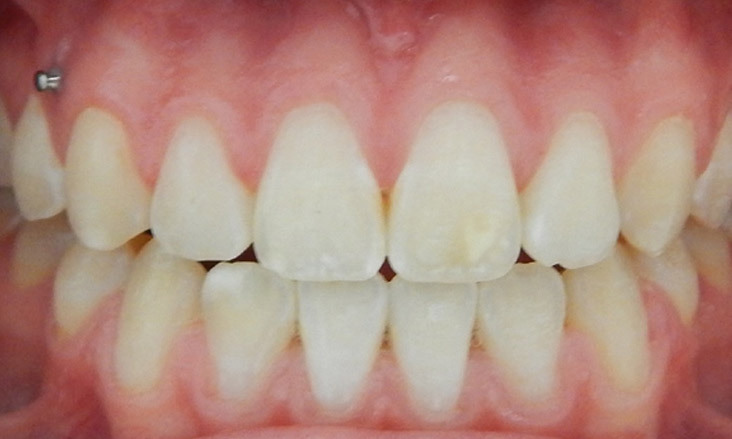 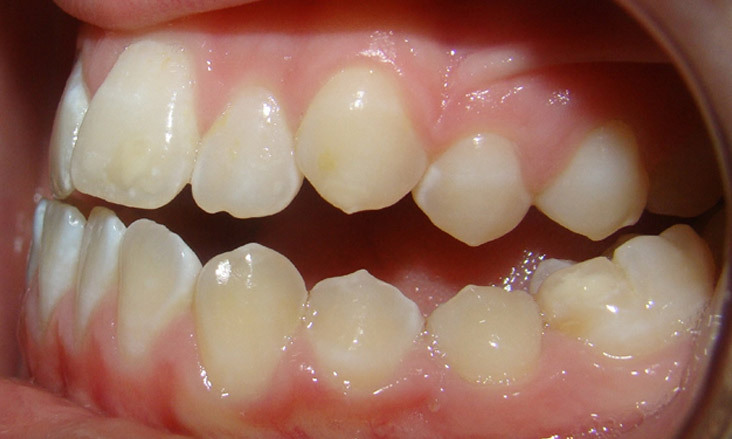 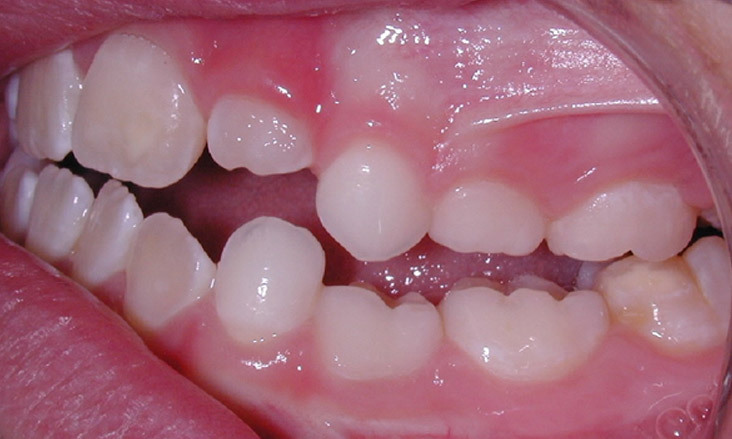 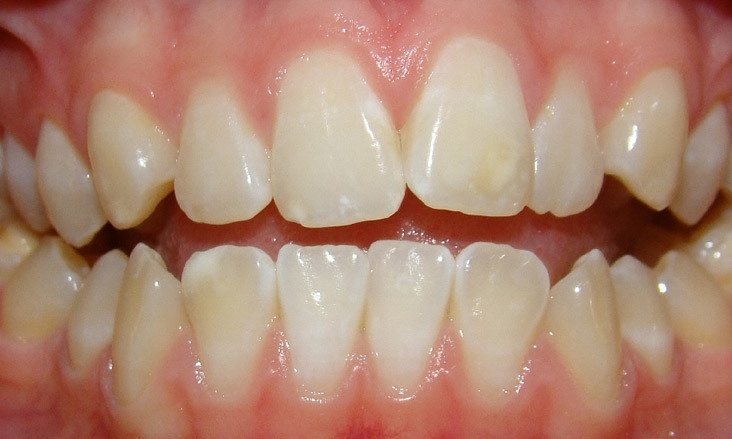 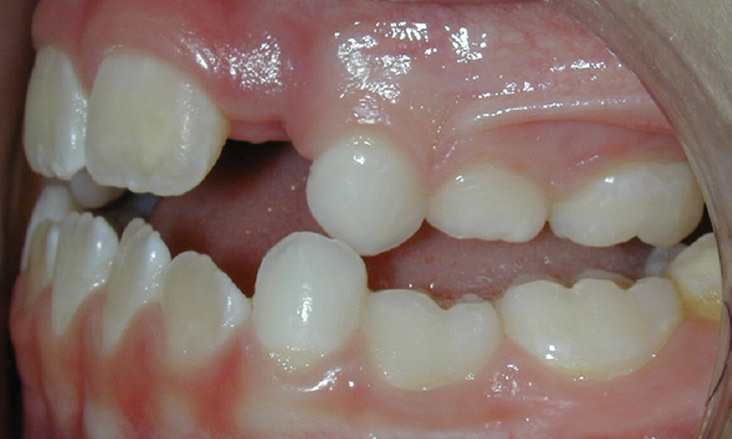 The bilateral posterior crossbites are back and this is partially due to lack of contact between the upper and lower posterior teeth. 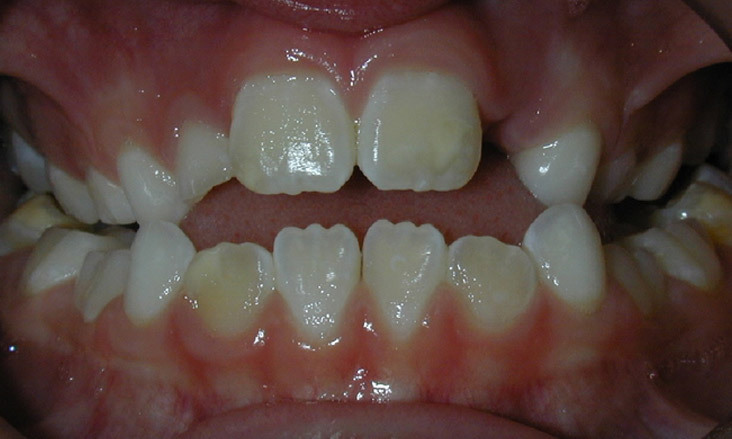 The upper posterior teeth have overerupted resulting in more tooth show of the upper posterior teeth compared to the upper anterior teeth. 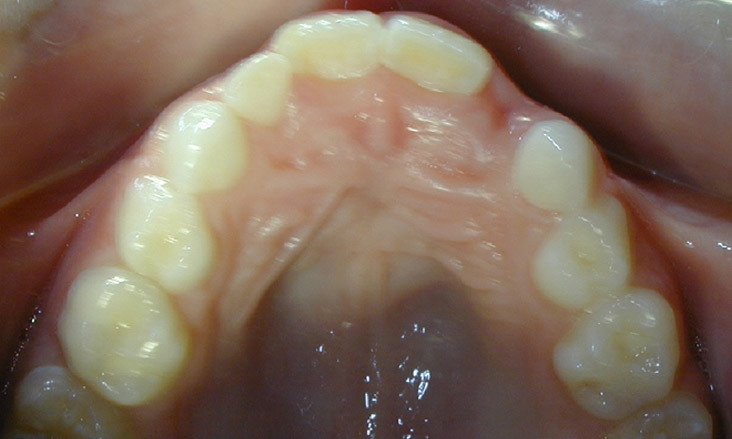 The lower first molar teeth are mildly hypoplastic. 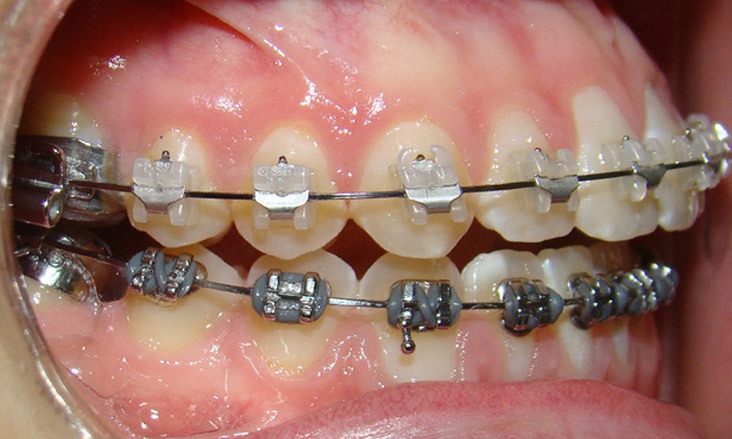 We used another RME to retreat the posterior crossbites. 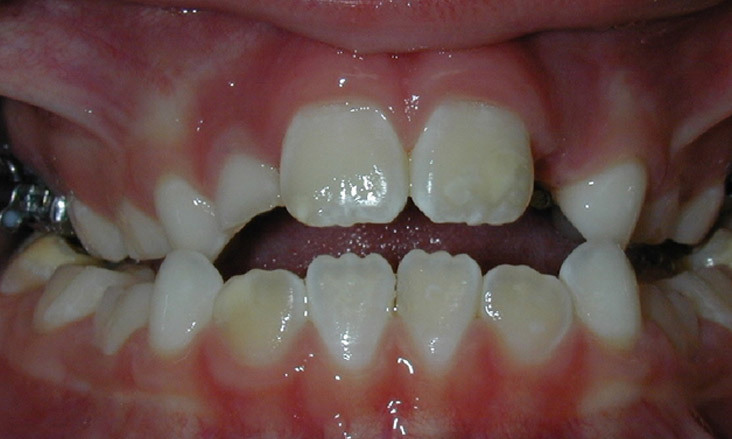 This has been successful and has reduced the amount that the upper posterior teeth are overerupted. 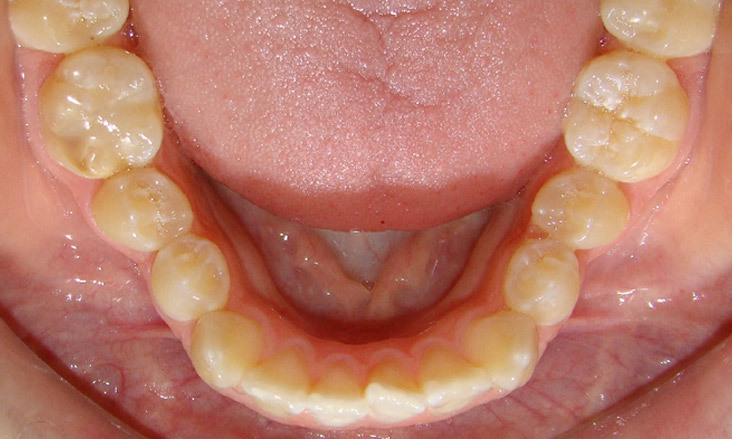 The aim for treatment from here was to get the upper posterior teeth in the correct vertical position and to create a cosmetically pleasing bite with the upper and lower teeth meeting at the back (interdigitation). 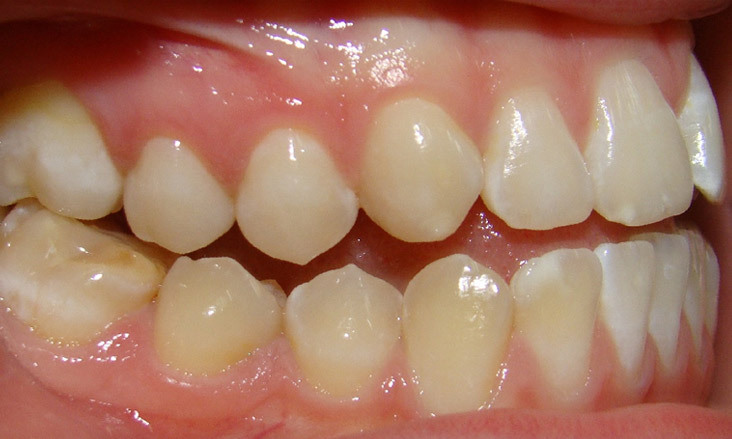 The adult lower first molar teeth were removed as they were hypoplastic and we needed space to overcome the crowding of the lower front teeth and move the lower teeth backwards slightly. 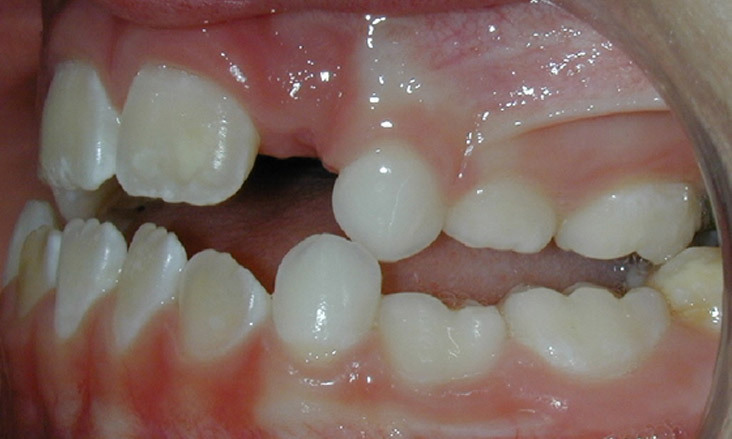 This will also create sufficient space for the lower wisdom teeth to erupt. 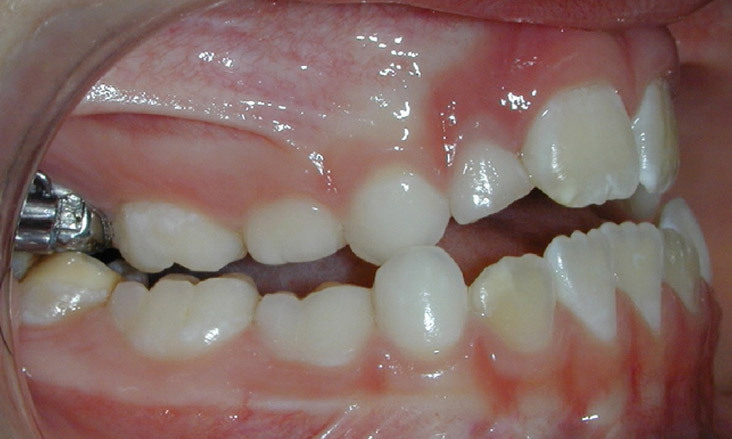 Another option for treatment would have been jaw surgery to move the upper jaw forwards or the lower jaw backwards. 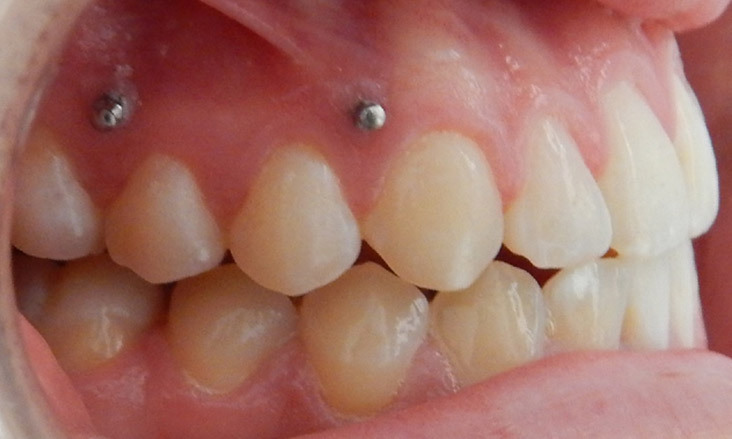 Bone anchorage screws (miniscrew implants or MSI) which are also called Temporary Anchorage Devices (TADs) are being used in the upper posterior region to intrude the upper posterior teeth and reduce the amount of gum showing at the back of the mouth. 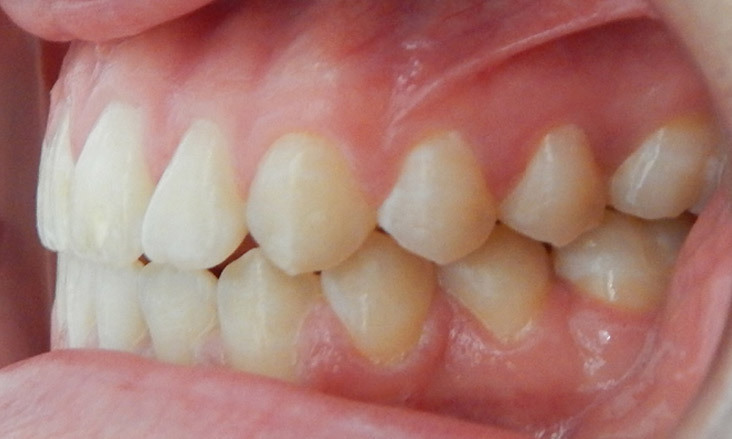 These MSI’s are placed under local anaesthetic and offer great flexibility in use. 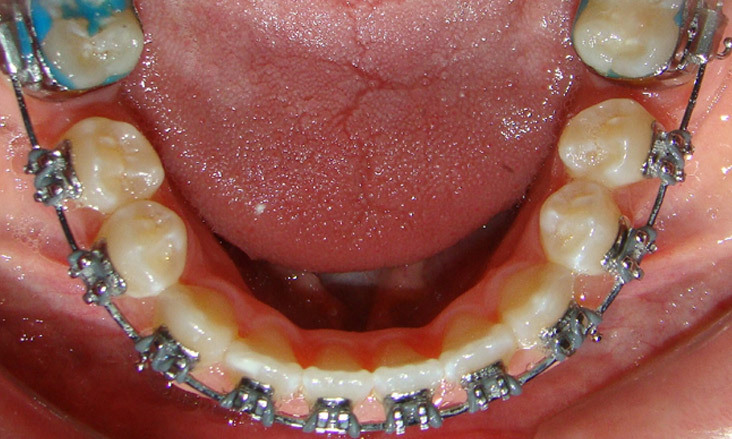 They can be easily and comfortably placed and removed. 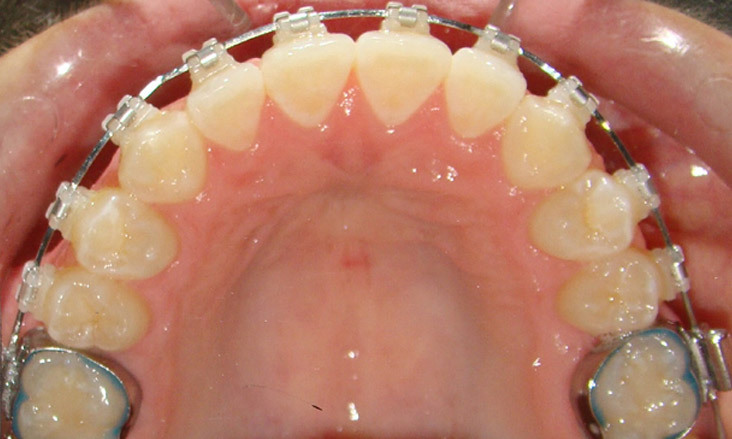 Braces are in place to improve the positions of the teeth. 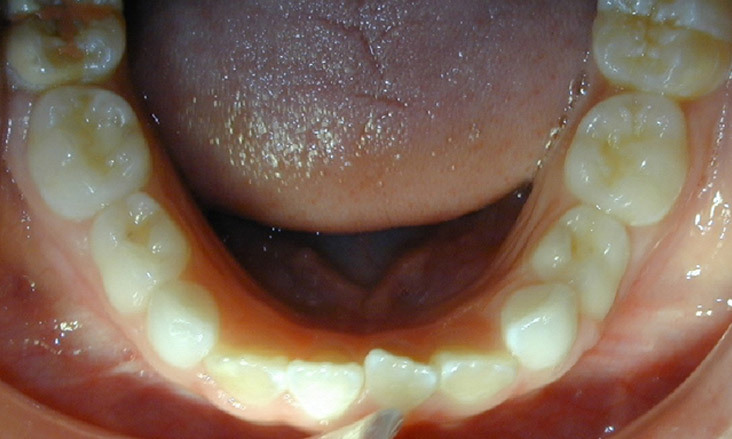 Note the spaces from the removal of the lower first molar teeth that are being closed. 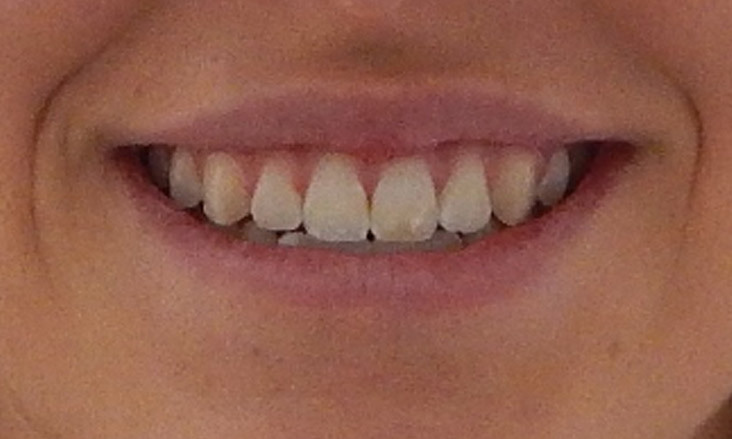 The orthodontic treatment has been completed. 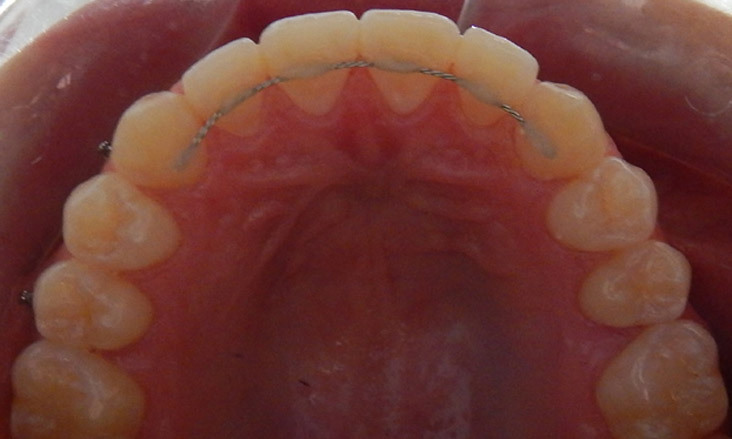 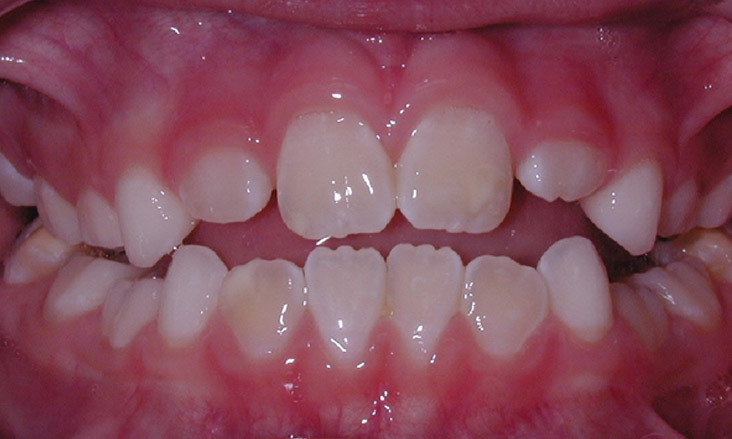 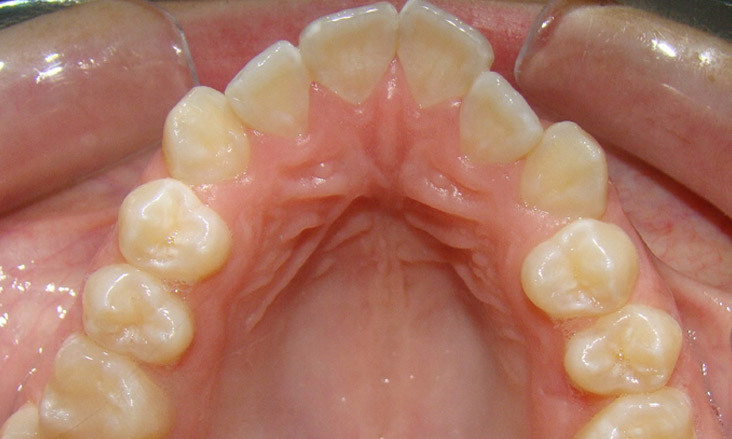 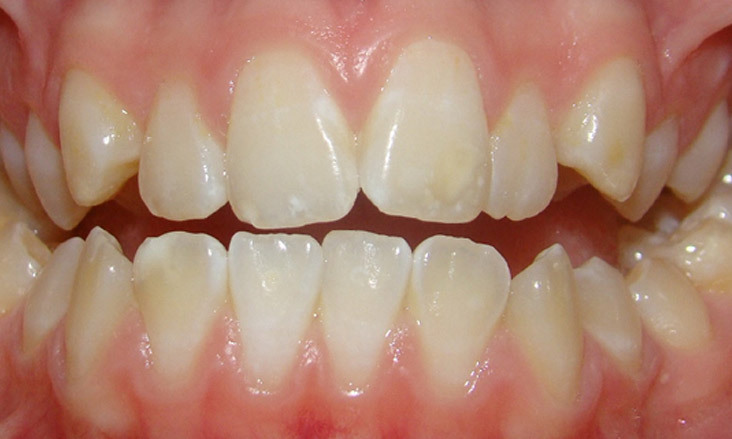 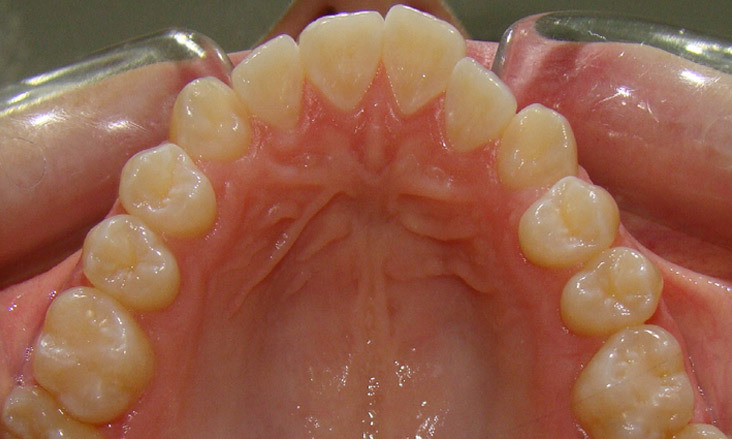 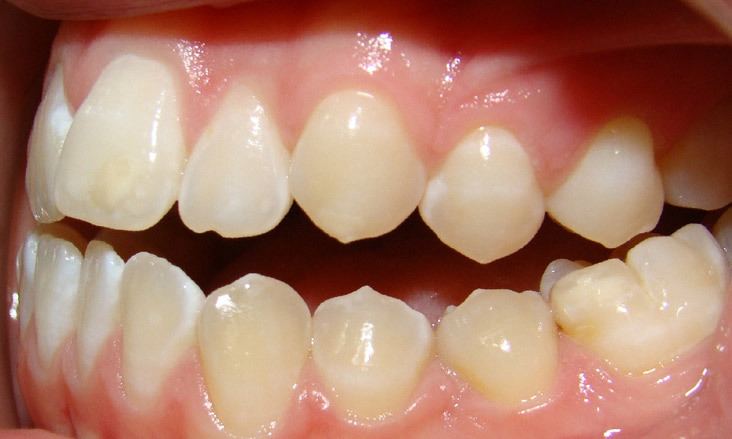 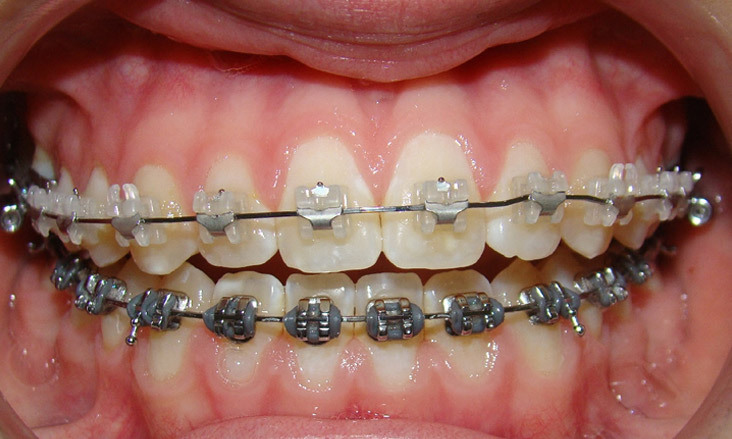 Fixed lingual retainers are in place for the upper and lower 6 anterior teeth. 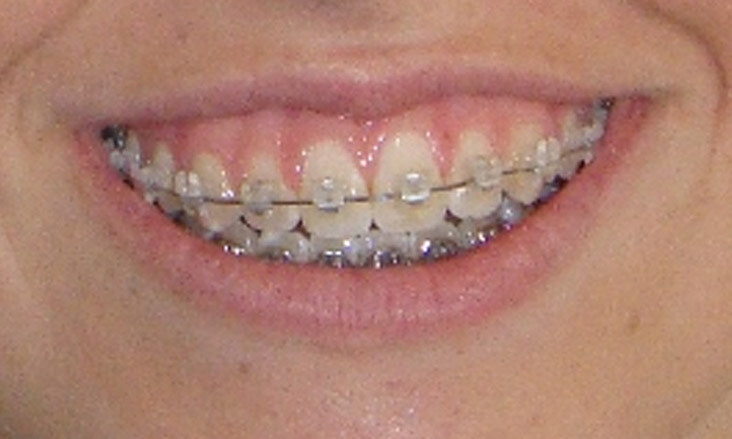 These retainers are being augmented by upper and lower clear plastic removable retainers that are worn of a night time. 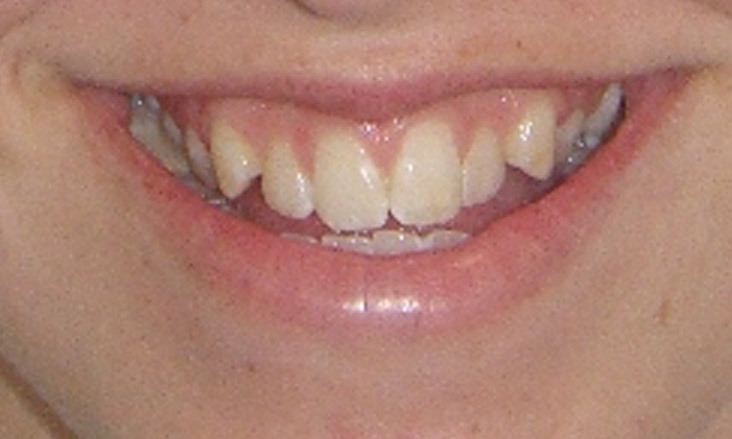 Note that the teeth mesh together nicely and the upper teeth are in an ideal vertical position for the smile.